...for the old immune system. This is beyond delicious. 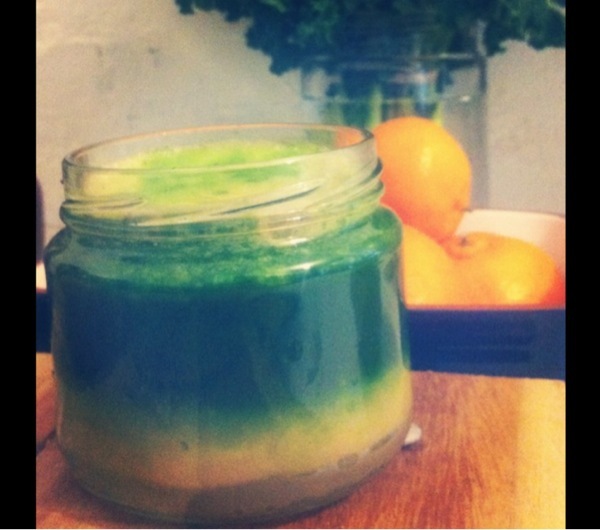 If you're not sold on green juices (grassy! Tastes like lawn clippings! ), this might convert you. The secret ingredient is lemonade fruit, which I appreciate isn't to be found at Woolies or Coles, but hey, that's just a great reason to check out the Farmer's Market! :) Lemon will suffice, if you can't procure a lemonade fruit, but start with a quarter of the lemon and see how it tastes. If your lemonade/lemon is organic, juice the peel, heaps of yummy vitamins and minerals in there. If not organic, please peel before juicing. Wash your veggies well if you're using conventional produce, k? Bung in your favourite juicer. Stir. Drink slowly. Mmm. Lemonade/Lemon: full of citric acid, which preserves Vit C activity and relieves congestion. High sulphur content dissolves mucous of respiratory system, cleanses body or toxins and has antiseptic and cleansing effect for the digestive system. Provides alkaline balance to body. Ginger: relieves inflammation due to compounds gingerols (they reduce the production of nitric acid that causes free radical damage). Boosts immune system, relaxes digestion, provides antioxidant power and is warming to the body. Kale: high in cleansing minerals sulphur and chlorine, help expel waste matter from body. High in chlorophyll, Vit U. Alkalising. Cucumber: great for the skin, hair and bones - high in silicon, sulphur and chlorine. Source of Vit E. Alkalising, diuretic, reduces excess uric acid in the blood. Celery: long history of therapeutic benefits - great for the liver! Contains phthalides which help decrease nervous stress. Great source of Vit A. High in organic sodium, keeps calcium soluble in the bloodstream so great for osteoarthritis. Anti-inflammatory, diuretic, stimulates the pancreas. Source of alkalising chlorophyll. Turmeric: anti-inflammatory powerhouse, source of curcumin. High in manganese, iron and copper. Today I am sharing a staple summer breakfast in my house, quinoa porridge. I regularly cook up a pot of quinoa at the start of the week and keep it in an airtight container in the fridge to throw it into salads, serve it up with lunches or dinners and, of course, make this yummy breakfast. Today we had homemade coconut milk in the fridge leftover from dinner last night; it tastes AMAZING, completely different to that tinned stuff! If you don't have coconut milk, almond, soy, moo or rice milk would work just as well. I scoffed this down after a walk along the breakwall with Evie the dog, and it was simply yum. Pop quinoa in a bowl (if you've just cooked a batch, it will be warm. If it's from the fridge you may need to simmer the quinoa with the milk to warm up. Yogi's choice!). Stir in chia seeds and soak water. Top with milk, dates, Brazil nuts, pepitas and blueberries. Shredded coconut is a great addition too, but I had run out. Eat! This breakfast is SO healthy, gives you long-lasting energy and is easy to digest. Quinoa (keen-wah) is an ancient seed, so great for those avoiding grains, and it's high in protein. It is coated in saponins, a soap-like substance that can irritate sensitive bellies. In general, the modern processing of quinoa removes most of the saponins, but to be safe it's a good idea to rinse your quinoa before cooking. Use a fine sieve! Or you'll lose your quinoa down the drain! If you have time, soaking quinoa overnight, or even sprouting, it is a great idea to reduce cooking time and make the seed easier to digest. You'll need to use a little less water when cooking as the seed has absorbed water during soaking. Maybe a quarter of a cup less? Trial and error people!